At lunch today my friend Jeff was explaining how the pain in his hands simply disappeared after his doctor recommended a vertical mouse to him. It seems that in normal typing and mouse action, our hands are in a position where the bones are crossed over, and a reorientation of the hands into a vertical position can make a dramatic difference in our ability to spend pain-free hours working at a computer. Anyone suffering from carpal tunnel syndrome or any painful condition of the hands, wrists, or forearms should look into this. Saw on Facebook, for what it's worth. Yeah! Especially here in Indianapolis where 2 houses blew up, there is a source stating a drone was hacked, had to be intercepted by a Prowler to be jammed, and it fired 2 hellfire missles, supposedly the Army's accounting and finance buildings located here in Indy, but the Prowler jammed the signal and they deflected into a neighborhood on the southside, killing 2 people, and nearly destroying 38 homes! Now with that said, I don't know how credible the source is, but they are eye witness accounts of people seeing and hearing what they thought was an airplane descending very quickly and crash into these homes. No plane wreckage, but would correspond with 2 missles. Plus the DHS is labeling it an LP gas leak, but LP gas isn't that volatile and couldn't destroy that many homes. And its just a strange fishy situation for us here in Indy. Seems like a cover up is going on! Dept of Transportation & Citizens Energy Group both report NO evidence of a gas leak, but DHS insists it is. Have you heard anything about this??? Eating Lychee "nuts" off a tree is the closest thing to picking free living candy. There are two trees side-by-side on B street in Petaluma and I usually grab a fruit every time I pass by jogging or walking. The app note for IAP calls (PDF), at least the assembly language part, is wrong. It may be a typo, where it says R0-R2 it might mean R0-R12. In any case, R3 was being overwritten when I made the call to IAP_ENTRY and it was causing my self-extending program to overwrite the wrong part of flash. For my standalone Forth, I need to be able to burn an image to the LPC2103 that leaves erased sections erased. Neither the Coridium load21xx nor lpc21isp do that, they both overwrite the rest of the sector with garbage from RAM. Though imperfect, I'm pretty pleased with the results from burn.py, which also contains an improved version of dump.py I uploaded a few days ago. It's an almost-complete implementation of the LPC21xx ISP (In-System Programming) interface. Trying out my 15-day-old colonche tonight. Observations so far: using vegetable oil on top as an airlock works well, as long as the presence of the oil in the final product isn't objectionable. I can't think of a way to get it all out, though just pouring it off the top worked quite well to eliminate most of it. The glochids are not evident in what I drank so far. Perhaps they dissolved in the process of fermenting, or they remained in the fruit that floated at the top, or they're in the sediment at the bottom. Though the fruits were orange in color, the wine is a rich magenta. I haven't yet tried the one that I "protected" with about 1/4 cup of maltose on top. Unlike the one with the sunflower oil airlock, this had a buildup of microorganisms on top, that same dust-like growth that plagues many of my fermentation experiments. But it looks like I got most of it off along with the fruit I removed from the top. And it smells sweet and delicious. Stir all dry ingredients together, then add in the yogurt and stir until dough becomes too stiff for the spoon. Knead dough in bowl until it holds together well. Turn dough out onto floured surface and knead for 5 minutes, until feels elasticity. Put dough in an oiled bowl and let dough rest 1 hour. Turn dough back out on floured surface and roll out. Cut dough into 10 pieces. 1 piece at a time, roll the dough out as thin as possible. Put that piece on a non stick griddle or cast iron skillet, high heat until the top forms bubbles. Do NOT flip. Yesterday someone on the WAPF list posted about chemtrails over Santa Rosa, and sure enough when I went out on my jog I saw miles of them in every direction, and a jet right overhead making one. Whether truly "chemtrails" or regular old contrails is beyond my ability to discern. And tonight there was a gorgeous sunset, but the red-and-gray cloud did look like a huge chemtrail from south to north. Was Matthew Stewart's battle with Ogden police one of the first skirmishes of the civil war? Finally learning ARM assembly language. Resisting the urge to make CALL and RET macros. between republicans and democrats, the argument is ongoing and loud. and in the libertarian community, you currently hear a lot of bickering between Ron Paul advocates and Gary Johnson supporters. yet republicans and democrats will often say they don't see any difference between GJ and RP. and they think it laughable if you tell them you don't see any appreciable difference between Barack Obama and Mitt Romney. 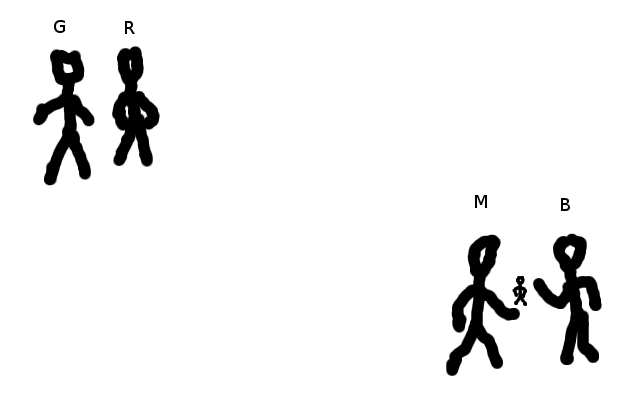 this badly-done drawing is my attempt to explain this phenomenon. the guy in the background is watching a fight between two people in The State: Barack on his left and Mitt on his right. it's obvious to him who is his hero and who is the enemy. but he looks over at Gary and Ron arguing over in Freedom Land, and they're so far away he can't see any difference at all. now if this observer were to cross over into Freedom Land, he'd begin to see noticeable differences between Gary and Ron, and then Barack and Mitt would be distant and barely separable. Very good method of communication I am impressed, the truth is anything you are close to and care about is going to be more detailed and therefore easier to quantify differences between parts of it. For most of our fellow citizens I think that everyone in your picture would look the same because almost everybody just doesn't care. The pieces just fell into place in my mind, while I was outside working on my kinetic sculpture, for a highly tamper-resistant, yet still private, voting system. And it doesn't even require computers. Here's the outline (all I have at this point). A voter shows his ID or whatever is necessary to get into the polling place. Once in, he randomly selects a ballot out of a stack of them, each in an unmarked outer envelope. He opens it, fills it out, puts it in a new unmarked envelope, and inserts it randomly into another stack of completed ballots. He keeps a carbon copy. The ballot has a randomly-generated unique ID number on it, which is also on the carbon copy. The list of all registered voters for that city (or neighborhood, in the case of large cities), in alphabetical order. A listing of all vote cards, with the unique ID and the votes, abbreviated to just the letters or numbers of the completed ballot, in order of appearance. Say for example, N8XVQ99899: CACCBBDAAAACDB, in alphanumeric order of the ID numbers. Everybody can look at the listings and see if any dead, minor-aged, non-existent, or not-registered people are listed as registered, and all their known-registered friends and neighbors are listed; can compare their ballot to their carbon copy and see if it's the same (and can file a complaint if not); can make sure the vote tallies match the raw ballots. Nobody but the voter can know the match-up between the registered voter and his vote, and he can only know his own, or any that was confided to him. Sure, I can see some potential for abuse; a voter could cheat by taking more than one ballot; unscrupulous poll workers can go into the booth after each person, steam open the newest envelope (which he can spot because he's made hidden marks on previous envelopes), and record the person's vote for later blackmail or reprisal; people can make a mistake and put their completed ballot in the new-ballot pile or vice versa; but each of these has solutions both legal and technical. More sinister problems down the road of privacy loss could even include microscopic RFID chips to tag voter with vote, but a solution could hopefully be found for that too. I can't offhand think of an easy way to abuse this system towards large-scale vote fraud though. Sure, there are some people who will file spurious complaints and alter their carbon copy, but a large number of such shenanigans would cause a public outcry, and proof of tampering would go on a person's record and/or cause their voting privilege to be revoked. And finally, the system could be computerized without losing any of the benefits, I believe. Thoughts? I've started reading Mike Vanderboegh's Absolved, which you'll probably love if you enjoyed James Wesley Rawles's Patriots and/or John Ross's Unintended Consequences. He (Mike) blogged yesterday that he was working on it again.